Offering the same sound-set as the Roland TR-808 it offers instant appeal to producers on a budget, so let’s round up the similarities and differences: Like the 808 the tomtom and conga cannot be played simultaneously. The 522 offers midi however and has separate outputs for the kick, a combined output for snare and rimshot, clap, hi-hat and a combined stereo output for the sounds without a separate output or without a patch-cable inserted. The TR-808 has an output for each sound. Unless patched every sound comes out of the stereo output by default. So, does it sound like the 808? Mmmyeano, probably not. Maybe. You can expect similar results from the Propellerhead Kong drum designer by using the analog parts or with an analog (semi-)modular synthesizer. It sounds thinner and less tinny than you might be used to from an 808, but then again, most 808 sounds and samples out there have already been processed with compression or amplification. The 808’s inner circuitry probably had a lot to do with it’s familiar sound and like the Roland TB-303 there are already too many discussions on as to ‘why it sounds like it sounds’. Plugging the MFB-522 into a distortion pedal or compressor yields very similar results as you might expect from the ol’ Roland. And there the comparison should end. The MFB is a drumcomputer in it’s own right albeit probably marketed at people who lack an analog 1980’s model in their collection. It’s a joy to just plug in a midi-cable and go to work. The midi-cc’s are neatly sorted making mapping easy. I use each output separately mixing and EQ’ing them back together on a mixer, adding extra crunch to the sound before it’s fed into my audio-interface. Some of the sounds can’t play together because of analog limitations making it impossible to play a snare and a rimshot on the exact same note, same goes for the cowbell and clave and of course the tomtom and conga because you have to flick a switch to choose between them. You can change the tone, tune and envelope of the sounds but playing live might be a bit cumbersome given it’s small knobs and featherweight design. The kick and clap come in two variants, shot and long, adding to the options of possible rhythms, and for some reason I was able to get four notes out of the tomtom and conga while the manual clearly states there should only be three. Oh well, bonus drum for me I guess! 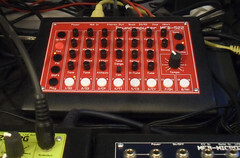 The 522 has three shuffle settings when using the internal sequencer, and can be synced to incoming MIDI-clock messages. Some of the sounds are great while others sound underwhelming, this is where layering and effects will make it shine again. It’s these imperfections that give you, the producer, a small challenge to make it do what you want. It might be a turn-off for some, but I kinda like that.. The Adafruit x0xb0x is a perfect clone of the TB-303 and yet it also needs a little work to sound like you remember a 303. Consider that before you give this a pass because maybe after ten years of sitting in smokey, moldy studios, basements and attics these machines’ll start sounding exactly alike, or even’ll start (mis)behaving in their own peculiar way. The MFB-522 drumcomputer by MFB is an attempt to give us back the joys of analog circuitry and tweaking knobs to fine-tune the percussion contained within. Mimicking, although not perfectly, the sounds and controls of the 808 for a very, VERY reasonable price.